A 12-year-old boy with a rare illness has been given a new lease of life thanks to a groundbreaking treatment using protein from hamsters. Oliver Moody, of Gildersome, Leeds, is missing a vital enzyme which breaks down harmful chemicals in his organs. The new treatment, which uses the genetically-modified proteins from Chinese hamsters, helps clear his body of toxins so he can lead a normal life. Oliver's parents fought for seven years to get the £300,000 a year treatment. 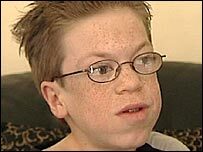 Oliver was diagnosed with mucopolysaccharidosis VI, also known as Hurler Syndrome, when he was four years old. The condition causes a build-up in the sufferer's cells causing symptoms such as impaired hearing and vision and skeletal deformities, and over time causes progressive damage and disease. 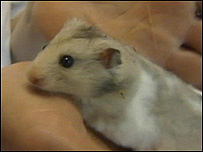 The treatment was developed by United States scientists and Oliver's parents spent seven years campaigning and fundraising to bring it over to Britain. Oliver has been taking the treatment for 10 months through a drip for four hours a week. His parents said the treatment meant he now has enough energy to play sport with his friends. His father Paul Moody said: "Goodness knows how they did it, but they discovered that these particular cells out of Chinese hamsters, when reared genetically and put back into the body, repaired the cells and meant his little body started working almost normally." It has also meant Oliver has started growing again. Before taking the treatment, he was 3ft 10in tall and had not grown in the last two years - but has grown two inches since. Oliver said: "I can run around with my friends and play sport. "When I tell my friends where the medicine comes from they don't believe it. They just think it's weird."